This post was written by Milan Vaishnav of the Carnegie Endowment, a member of the Lok survey research team. The chart below displays the responses. 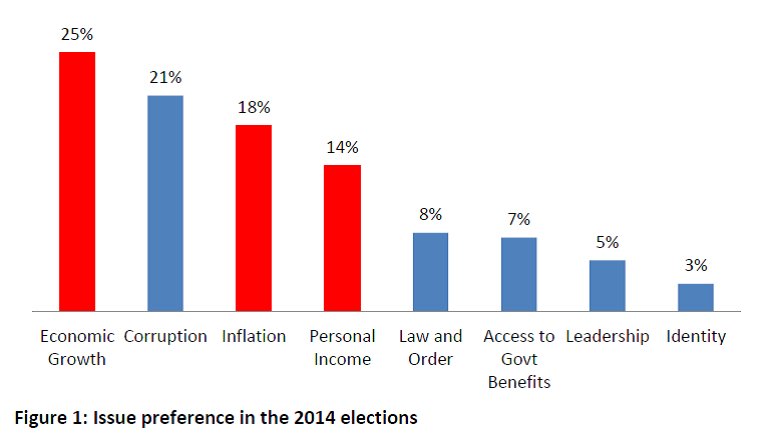 Economic growth was the number one issue, followed by corruption and inflation/price rise. The only other issue to break double digits was “changes in personal family income.” The dominance of economic concerns is striking: three of the top four issues are economic in nature (and it could be argued that the fourth, corruption, is linked with the economy). Yet what is not clear from Figure 1 is how issue preferences vary by state. 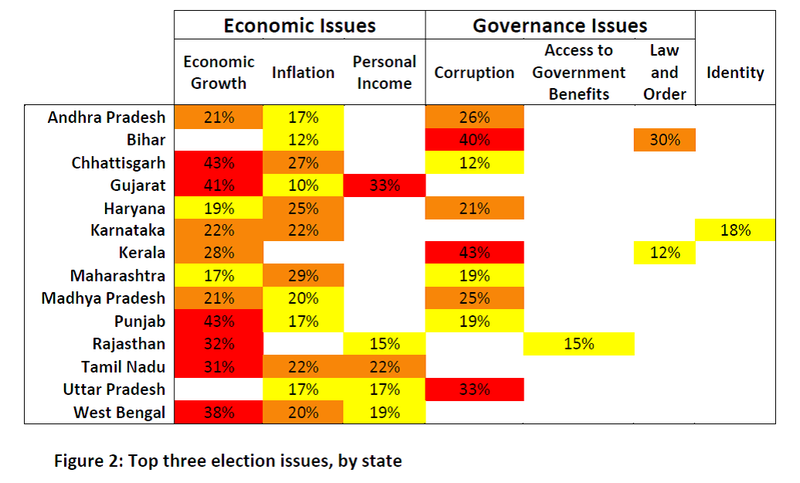 To understand the variation in issue preference across India, we created a color-coded matrix of the top three election issues by state. The dominance of the top three issues—growth, corruption and inflation—holds even when we disaggregate by state. Growth was a “top 3” concern in nearly all states except for Bihar and Uttar Pradesh (UP). Bihar and UP are moved first and foremost by concerns with corruption, with is understandable perhaps given their reputations for poor governance, followed by law and order (Bihar) and personal income (UP). Inflation ranks third in both states. What is remarkable is, across all states, how few respondents identified issues related non-corruption related issues of governance or personal standing as priorities. What does this chart tell us? First, voters are angry about the state of the macro-economy and are much more seized with what political scientists refer to as “socio-tropic” economic concerns rather than pocketbook issues. Given that these issues fall within the purview of the central government, this is not good news for the Congress-led United Progressive Alliance (UPA). Second, despite the occasional bursts of protest and media attention on issues of pubic safety, law and order does not seem to be a top issue in most Indian states, with the exception of Bihar and Kerala. Interestingly, despite their many differences, voters in Kerala are equally bothered by corruption and are the only two states to identify law and order as a priority concern. Third, Neelanjan commented on the low ranking of identity issues in his previous post (and we will have more to say about this in next Sunday’s Times of India piece). But one issue which does not figure into any state’s list of top 3 priorities is “leadership.” It could be that the concept is too vague for voters to grasp, but its low rating seems odd given the association of this attribute with BJP prime ministerial candidate Narendra Modi. What this perhaps reveals is that voters are not looking for a strong leader in the abstract; it’s really direction on the economy they are looking for. Thus it appears that in India, as in the United States, it really is about the economy, stupid. Categories: Lok Surveys, Pre-election survey | Tags: Corruption, Economics, Identity Politics, Lok Sabha Election 2014 | Permalink.